Has an Awesome God And Family of The Lord. Having a great time with family with going to the mall,out to eat ,and spending quality time with my family watching Movies. I was inspired to write my book oh how I love you,I went through a rough divorce and my daughter was effected and thought I didn't love her .I wanted to reach out to her and express my love from my heart to her. I love you Sarah Always have always will,I may have made mistakes but I'm here for you now able let's hold each other hand till the end of time and move on to eternity life is short on Earth but eternal in the after . I love you Sarah love your momma. Mary Also owns a small Business called Mary's Weddings in Queen Creek AZ. 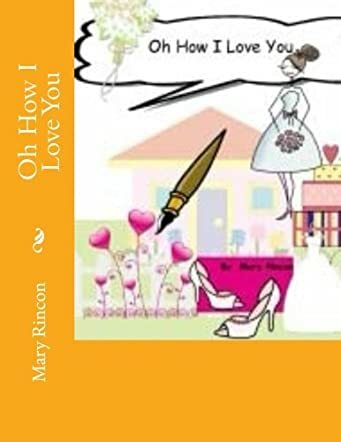 Oh How I love You by Mary Rincon is a story of a mother who feels sorry for her daughter because her divorce ruins all the special plans she has for her daughter. She tells her daughter that the branches of the family tree fall only when there is no forgiveness, and the tree grows with hope and faith. The mother tells her daughter that she loves her and not a single day goes by without her thinking about her daughter. The book speaks about the hurt children have to go through because of their parents’ divorce and how parents also go through hurt when it comes to making life choices. The author stresses the importance of having faith in God and creating a good future by trusting in the Light of God. I like the way in which the author speaks about God and His presence and power to children. The presentation of the story and the formatting is original and unique. The illustrations are charming and they capture the author’s thoughts and words with clarity. It is a good story for all single parents to read out to their children to help them accept and understand life’s choices, and also build their faith in God so that they have the strength to make changes in their lives. Teachers and educators can use it in classrooms to help children understand the importance of having faith and hope, despite the setbacks they face in their lives due to divorced parents.